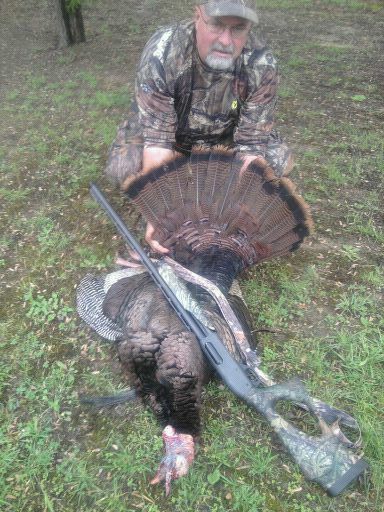 Tom Kelly of Morgantown, W.Va., bagged a gobbler for the second straight spring on April 26. The bird weighed 22 pounds and sported a 10-inch beard. Ah, the spring winds blow and the rains fall. The greenery turns greener and fills in the woodlands. Then panic sets in, especially before the darkness even turns into fuzzy light on the May 7 opener. OK, maybe it used to be like that. It's not so much anymore. I've learned to use the ever thickening flora to my advantage. Such as by finding hidden strutting grounds inside woodlots or ambush points between well-used open farm fields. Sometimes the turkeys creep in silently through the woods from behind your position and bust you anyway. It's all a part of hunting. It was awesome to see a longtime friend of mine in West Virginia, Tom Kelly -- a recent convert to turkey hunting -- mix up his calls last week and draw in a gobbler for the second straight year. After a mid-morning downpour, the bird was answering his box calls but would not budge from the field he was on above from where Tom was positioned. He switched to a slate call and down he came right into Tom's lap for an easy 25-yard shot. Can't wait until it's my turn. For more on this hunt and Tom's hunt from last year, log onto www.macshuntingmag.com.